Back in August of 2015, I connected with Deepthi Guttikonda (Dee) who was co-owner of the product development firm Visual Antidote (VA). She was in the market for a product designer to join her team. Though I wasn't able to take on the role at that time, we kept chatting and decided I would run a Design Thinking workshop for her team to teach them new skills as well as explore real ideas for new products that the firm could develop. 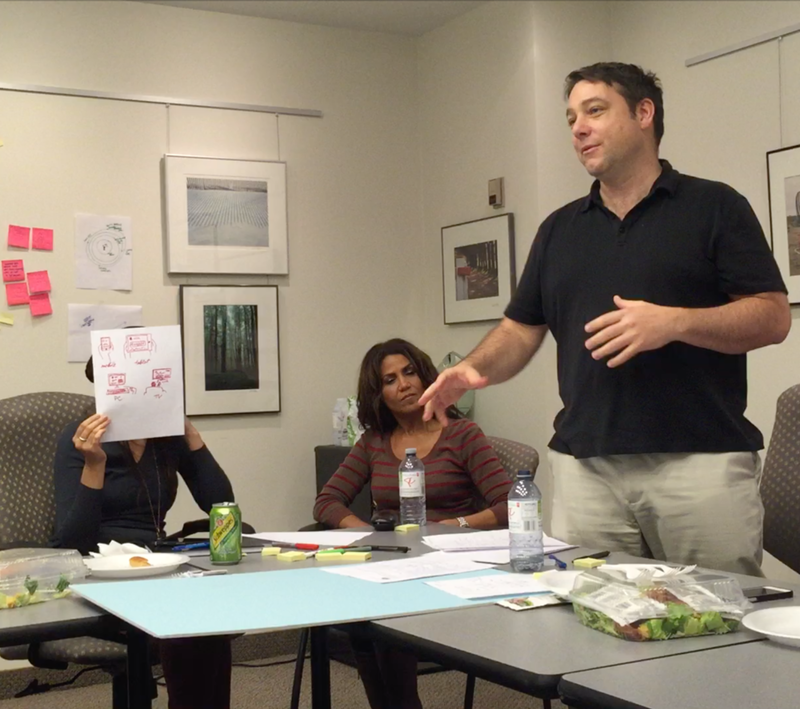 I was eager to get my feet wet in Design Thinking and workshop facilitation. It is a methodology/framework to work within to help make cognitive connections and solve big problems. Simply put, it is a process of understanding human needs and then designing something that meets those needs. It can help guide you to find the unknown challenges and frustrations that people have within your problem space which will help you to design new products outside the constraints of existing solutions. 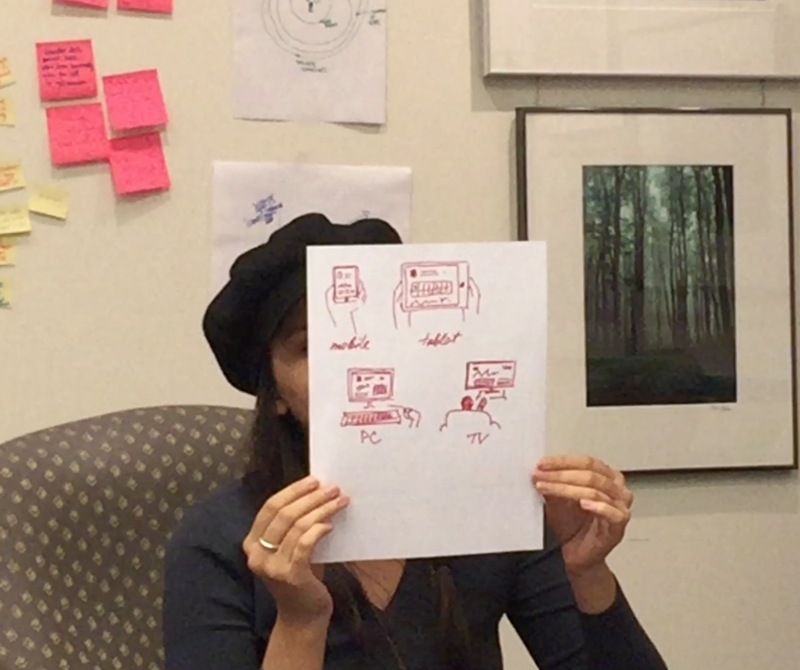 I planned to identify a problem space of interest to Visual Antidote and then run through the design thinking process with the VA team to create solutions in this space. I was using the IDEO Field Guide for Human-Centered Design as my resource guide as well as a lot of recently acquired research and knowledge about the design thinking process. We settled on the problem space of the workshop to be the healthcare experience for people with a chronic illness. The VA team would be split up into four groups, and each group would be working on an independent solution. The core of design thinking is to start with empathy development for your end user (I'll explain empathy development a bit more in Stage 1 of the workshop). If this workshop was going to carry the impact I was hoping for, I would have to provide a way for the groups to develop empathy. The best way to do this is to observe or interview your end-user. Dee and I rounded up 4 participants who either had a chronic illness or were the family of someone who did. Each participant joined a group and acted as their end-user for that group. I put together a presentation guide to use throughout the workshop, and we were ready to go! Stage one of the design thinking process is Empathize. In the empathise stage, you try to understand your end user and immerse yourself in their world through qualitative research (observation & interviews). Through this practice, you will begin to develop insights that will help you define your design challenge. The groups began their empathy development by taking 5 minutes to interview their end user. During this interview, I encouraged everyone to ask broad questions and get to know the person at a high level. As participants began giving details about themselves and their lives, I encouraged them to write notes onto post-its and start sticking them on a board to share with the rest of the team. This process helps to begin sharing thoughts and ideas within the group. Once the first interview was completed, every group took 2 minutes to reflect on what they had learnt. They wrote more notes and began to look for areas where they needed to learn more. In the second interview, groups had the chance to dig deeper into their users' context and needs. From my readings, I had come to understand that problems that cause people to have an emotional response are probably of value to investigate further because their solutions will often have an emotional connection. People care about things they connect with on an emotional level. So, I encouraged the groups to ask more questions around topics that triggered an emotional response. The teams took 2 minutes to complete writing notes and discussing what they learnt. Once each team had finished writing all of their note they got up one-by-one and shared their findings with the larger group. As they told the stories they had learnt about their end-users, they placed their post-it notes on the wall until each of the four groups had a chance to share. While other groups were sharing, everyone was encouraged to keep thinking and writing new notes and observations gained from listening to the other group's presentations. At this point, you could feel the empathy and understanding growing in the room. Everyone got up and went to the wall full of notes. Together, we began moving the notes around looking for patterns and relationships. As we started to notice themes developing, we made new post-it notes with the theme name. It is interesting to note that humans have evolved to see patterns, relationships and inconsistencies naturally. It was time for the groups to reform and focus back on their end-user. Groups hypothesised on what their design challenge might be (e.g. we need to create X to improve Y for our end-user). Then they selected up to three of the major themes from the previous step that supported their hypothesis and wrote insight statements (facts) about those themes. This step helps to get to the root of your design challenge. By turning themes into statements, we begin to see our problem more clearly. For this step, we used a worksheet to reframe our design challenge. Groups started by answering a couple questions like, what is the problem you're trying to solve, what are some possible solutions to your problem, what are some of the context and constraints you are facing. They then framed their problem as a design question (How might we... ). With their newly formed design question, groups brainstormed ideas to solve the problem. It's best to get ideas out as fast as you can. Write all ideas down, the good and the bad, if only to get them out of your head so you can move forward with new ideas. Groups selected their most robust idea and began deciding how it would work, features, technology which would work best for their end user. The end-users participated in the whole process and helped to keep their needs top of mind. Prototyping helps to visualise your ideas so you can gain useful feedback from your end-user. Each group sketched or storyboarded the solutions together. We weren't able to test our solutions within the workshop, so instead, each group got up end presented their solution. Story: Our end-user is on a journey where she is getting better over a long period of time. Her challenges are little things like taking her medication on time. She also has periods of time where she is taking medication and not feeling well and periods where she is feeling well. If by accident she misses her medication, then the next day would be a write off. So if she wants to make plans 2 weeks from now and a friend invites her to a ball game, she’s not going to be sure if she will be healthy or not because of her medication pattern. To reduce the stress of all that, were going to make a time management web app that will be available on different devices such as TV, phone, computer, iPad. Our end-user cant be too close to electronic devices. So for her, were going to build the TV experience so she can interact with it through a remote. The screen would be designed in a way that she could read from a distance. There will also be a task manager so she can check off what she has done such as taking her medication. Her high and low pattern of how she is feeling would we shareable with friends and family based on her medication schedule so that they can check in and see when she will probably be feeling well and when it is best to make plans. It really made her feel bad when someone asked her to go out but she wasn’t feeling well and couldn’t go. Hopefully this tool will help her stay on track and take advantage of all the days where she if feeling well. Everyone successfully designed a solution to a burning problem for their end-user. Everyone fully immersed themselves and trusted the process which helped to make this workshop a success. I was so impressed with the VA team and their success. I had also learnt a lot from observing and facilitating the workshop. We all left feeling energized and inspired!